Our car stopped at the bent of narrow roads through Chotanagra panchayat. As we walked down, a group of 15 people was waiting in Dhobil village gathered by Lakhan Soren, a community volunteer who works for community rights and empowerment in the area. “More will join us soon,” said Soren as we were there to find out the state of mining-affected communities in the area. He pointed towards Dhobil iron ore mines, a little more than a kilometre away where some of the people were working. Dhobil, a small village in Chiria hills of Jharkhand’s West Singhbhum district, is where Steel Authority of India Limited (SAIL) operates a number of iron ore mines. Mining has been going on in this area since around the time of independence. However, in nearly 70 years’ time, people in Dhobil and neighbouring villages feel threatened by mining activities. The threat is to their earnings, their livelihoods and that they may be put behind bars. West Singhbhum is the top iron-ore mining district of Jharkhand and Manoharpur is one of the key mining blocks of the district, besides Noamundi, Gua, Jhikpani, etc. According to latest information of the state mining department, the district produced about 16.3 million tonnes of iron ore in 2017-18. However, years of mining have not benefitted locals. While profits have gone to mining companies, contractors and state government, but the region suffers from acute poverty, income instability and under developmental issues. More than 65 per cent people in the district fall below poverty line. Nearly 54 per cent households in rural areas of the district have the highest earning member getting below Rs 5,000 a month, a below-poverty-level income. “The government says mining will give us jobs. But the mining work is mostly outsourced to private contractors in these areas. When young people like us go to these contractors to ask for any kind of work in the mines, they are turned away,” said Soren. But what is worse is that the people asking for work are often threatened by the mine operators that they will be put behind bars. “We are young people and need work. But if we are put in jail, we do not even have the money to get bail. So, most of us have stopped asking for work,” said Sunil Murmu, a resident of the area. Next stop was Rangubeda, a small tola (hamlet) inhabited by about 50 households in Mandu block of Ramgarh district. People living here mostly belong to santhal tribe. The tola is less than a kilometre away from Tapin coal mines, owned by Central Coalfields Limited (CCL), a subsidiary of Coal India Limited. “When the mines started, we thought it will bring employment to our village but only 15 people from Rangubeda were hired in the mines. The mine has expanded thereafter but we have never benefitted from it,” said Manjhi Hadam, the traditional head of the tola. We then moved to Chatra. This lesser known district of Jharkhand, is where the state’s coal future is largely lying. Magadh, owned by CCL and slated to be Asia’s biggest coal mine, is operating in the district’s Tandwa block. There are four more major coal mines of CCL in Tandwa. In all these five mines, which are in close proximity to each other, the district produced nearly 32 million tonnes of coal in 2017-18. However, this means little for the community of Devalgudda tola, which is about 500 metres from the Magadh mines. About 170 household inhabiting this tola, mostly from the Oraon and Munda tribes, is stricken by poverty, unemployment and lack of basic facilities. On top of that they are threatened by mine operators if they ask for compensation or work. Lakhi Oraon lives with a family of seven in Devalgudda tola. “About three years back I lost my two acres of agricultural land and seven Mahua trees for coal mining in Magadh. But I have still not received any compensation. Now I have no land for agriculture and no money,” said Oraon. Owing to this, the local tribal community is extremely fearful of further expansion of these mines. Not just Magadh, the fear is pervasive among communities around the Amrapali Mines as well. “The mines have been outsourced to contractors who come from outside,” said Surendra Tirkey, a local community leader. “They never talk to the communities or listen to their problems,” he added. It’s not just that their demands are unheard, but they are suppressed. “A number of cases have been lodged against locals when we demand for our rights of appropriate compensation, work, and resettlement and rehabilitation. There is now fear among the community for raising any voice against the company,” said Tirkey. The resentment of locals on joblessness and insecurity is clear from government statistics. 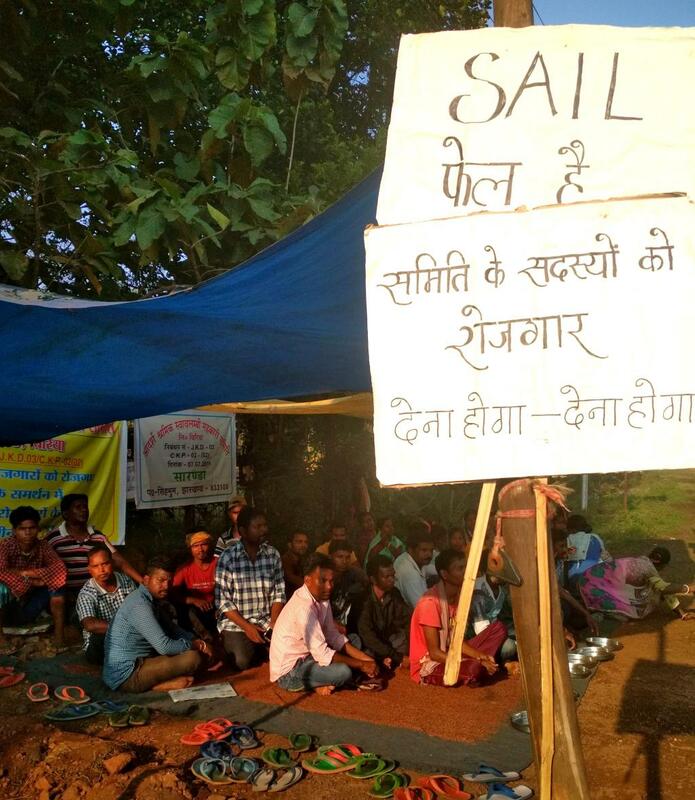 In the iron ore mining district of West Singhbhum, about one-third of men in the working age group are unemployed and two-third of women in this age group are unemployed. In the coal mining districts of Chatra and Ramgarh, the proportion of non-working men is similar. Using the District Mineral Foundations (DMF) funds for these mining areas, the state government and the district administration need to create livelihood opportunities for these people. For instance, West Singhbhum has more than Rs 600 crore in DMF, in Ramgarh and Chatra, the fund amounts to more than Rs 524 crore and Rs 476 crore. According to the Mines and Minerals (Development and Regulation) Amendment Act, 2015, this money must be used for the “interest and benefit” of the mining-affected people. And, creating livelihood and income security for the mining-affected people is one of the best ways that DMF in these districts can benefit them. In fact, livelihood and skill development is one of the key issues for which DMF funds must be spent, say Jharkhand state DMF Rules. There is also clear direction on this from the Ministry of Mines. What kind of livelihood will be most suitable for the local communities must be determined through an inclusive and need-assessment process, and then funds should be allocated. However, no district has so far taken the necessary steps. In most places, the local communities do not even know about DMF and the scope and opportunity it has for them. These people do not know that since 2015 there exists an institution and fund (DMF) which ensures they are not denied their right for a good life, their requirement of a livelihood and their aspiration for security.